Show us your keychain and tell us about the keys and things you have on it. It was just one that was in the rotation. Notice how simple a task it was- ask people to share something that they always carry with them. This was also in the first week or 2 of the ds106 classes Jim and I were teaching at UMW. And we had an accidental discovery. This assignment, doing a 1-2 minute video, was rather effective in having us get to see each other, where we sat down in our homes, dorm rooms, offices to talk about keys. It was a tiny but person window into all of us. 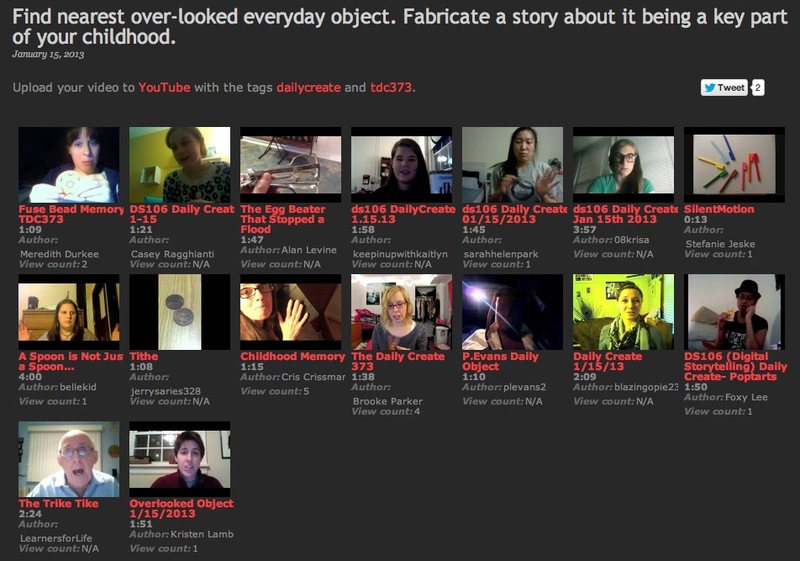 You get a sense of it just looking at the previews of the videos, rows of faces. Just by asking people to doa video talking about their keys. That has long been one of my favorite examples of the Daily Create. I liked it so much, that I had it repeated in Fall 2012 as a required first week activity for ds106. Okay, maybe not the greatest prompt. And I can see that a number of my students glossed over the word “fabricate”. I try to tell them this is maybe the one class where they are encouraged to make stuff up. I will nudge them later to continually change reality, to be fictional, to play with the idea of truth. Bur frankly, I don;t care what story they tell for this Daily Create. We do not grade it on some goofy rubric, there is no “right” way to do these. It’s up to each person to interpret the assignment. So if they tell a true story, fine. If they don’t explicitly follow the prompt, fine. The whole point is to try and do something new, different, stretch. And actually the point of this one is to get a lot of people doing videos. It helps me as a geographically distant teacher to know students better. And there are also the open participants, and a few individuals I am not even sure who they are, who are in the mix. Just because this assignment as passed by does not prevent you from doing it (or give you an excuse not to) http://tdc.ds106.us/tdc373. If at a minimum all you do is watch a few, and leave some comments, you are helping out my students a lot. Do not underestimate the impact, especially for people new to blogging and social media, to find out that someone is listening, and maybe can step up and more than click a dumbass “like: button. Write a comment or two, eh? Or just check out the videos. I was definitely ROTFL last night watching the ones coming in. These are open windows into individuals, by engaging with them, you can make those two way windows out to the world.